Many of you have read my post about my One Day Trip to Disneyland last week. I had a ton of fun getting to see the park again. I hadn't been back since high school which is a lot longer than I'd like to admit to. I didn't remember it as much as I had thought and that's primarily because I'm used to the Magic Kingdom at Disney World. As mentioned in my previous post, I was in the park for approximately 11 hours straight and learned a lot about the ins and outs of the park. These are my biggest recommendations for you, your travel partner, or your family. Hydrate. California is hot during May to September and if you're from a rainy city, like Portland or Seattle, you're not going to be used to it. Drink as much water as you can, you won't regret it. Bottle water at the parks are $3.25 each right now. I recommend bringing a hyrdo flask or water bottle to ask cast members to fill up at a dining area. Another trick is to ask for a large iced water, instead of a bottle. It's free and you'll save a lot. Don't go on a weekend in May. Grad nights. Kids are out of school. Parents are not at work. That's the math and the key to it all. If you can manage it, go on a weekday to avoid the parks being at maximum capacity. You'll get to ride rides and get to actually see the parades by not sitting and reserving a spot 2 hours before kick off. Get a locker. A small locker is $7 for the whole day. Stash your stuff on Main Street and be free from the distractions of caring a bag or sun screen through out the day. Especially if you have pockets. They have lockers that will charge phones too! Avoid the Lunch Rush. Avoid noon at all costs around dining areas to eat. Food can add up at the Parks, that's a given. It's probably around a 200% profit increase for the mouse but the food isn't terrible and it is fun to sit and enjoy the day in a restaurant. Time your mid day meal for 1-2:30pm instead. You won't regret missing the hustle and bustle of the crowds. Get the Disneyland app. A total game changer when H and I found out that all of the ride wait times were on the app. Including all of your photos and a digital map with spots to indicate restaurants, characters and shows. Download the app here. Plan your Fastpasses. The minute you can get another fastpass, which will be indicated on your last fastpass ticket, go to another ride and grab another one. I stacked those tickets up so fast. At one point we had three in our hands and felt rich! We stood in line for a ride and while we waited on other fast passes. Be Nice. I walked up to a cast member at Big Thunder Mountain because we saw the ride was down and had fastpasses for later. Instead of asking her the question she had been asked 200 times since the ride went down, I asked another questions first "Hi! How are you?". This question caught her off and she politely responded. I asked another question about frozen lemonaides and then I asked about the ride and our fastpasses. She responded with her spiel and then followed up with "You can also check the Disneyland app for when the ride is back up again." THIS was the moment she made magic and introduced H and me to the app. She hadn't mentioned this to any other guest but because I took the time to have a 1 on 1 conversation with her, she total changed the game for us as guests. We literally wouldn't have known about the app unless we had nicely asked her a question. Get a Button. 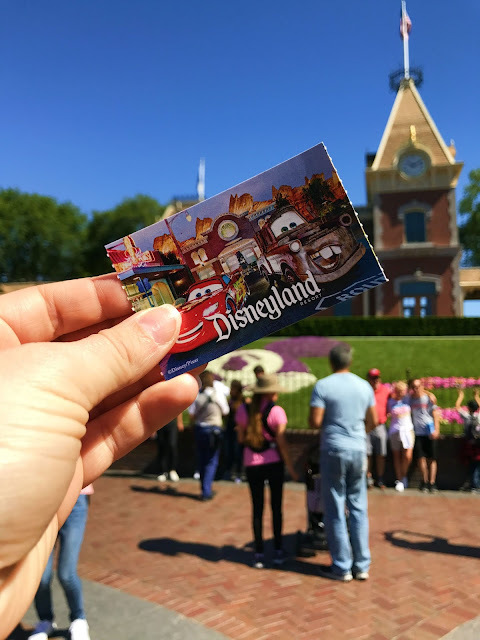 Are you going to Disneyland to celebrate your birthday, anniversary, honeymoon or just your first time being in the parks? Stop by Guest Relations (front of park) and ask for a button. This sounds silly but literally 85% of cast members will take the time to wish you or celebrate your day with you. I wore a birthday button for the last half of the day and it made my day more magical. Its nice celebrating with 65,000 other people. Plus, it's a great conversation starter. Don't expect anything. H and I decided to get dinner in Tomorrowland. We picked the wrong line and ended up behind a Girl Scout troop leader that was ordering 20 kids meals. She wasn't being nice to the cast member taking her order and was very rude when she waited for the drink order. There was another guy behind the troop leader who was also rude. By the time we got to the front she was feeling it but kept going' and asked "what can I get you today". I told her my order, gave her my card, then did the unexpected. I told her "I just want you to know that you're doing a great job today. That order was rough and you're doing great". She smiled, said thank you and then gave us both free chocolate Darth Vader mousse cups! Valued at $5 each. Being nice goes a long way at Disney. Give Back. If you read through 9 then you know H and I got free mousse cups in Tomorrowland. Well, H ate hers right up but I have a dairy allergy so I found a table with a set of parents and three kids eating close to us. I told them a shorten story and offered them my free dessert. The youngest brother LIT up, you guys. Just pure joy for dessert. Dessert is expensive and I knew a family of 5 would enjoy the treat. The mom was so gracious. Give back, y'all. What's wrong with making a little magic yourself? Utilize First Aid. Have a headache? Need to lay down or are dehydrated? Are you sick, get a cut, need a bag of ice? Use the first aid center. Those cast members are eager to help out in any way they can and sometimes needed help can't be avoided. Sometimes you need to get out of the sun and just lay down with a bag of ice on your head and that's okay. Skip the Parades. If you're there for fun and adventure, skip the parades. Not saying they aren't a blast to watch. Those performers are amazing but if you're young and spry and got an eye for rides, this is the time to get in line. Everyone else is sitting down watching the show while your wait is shorter. $10 Silhouettes. Something I totally regret not doing. I should have gotten my silhouette taken on Main Street. It was $10 and I've seen another Seattle blogger's portraits in a decor post here. They are amazing and would make a beautiful family set together. $10 is a total steal. Skip the $20 frame and buy them when you get home to be more cost effective. Do your Shopping at the End. The best thing H and I did on our day trip was grab all of our goodies at the end. We walked through Main Street while we waited on a fastpass. We took inventory in our minds and then grabbed lollipops, key chains, mugs, Ana and Elsa necklaces and a sippy cups before we headed to the airport. You can grab a reusable bag or just their standard bag as a carry on. Be in the Moment but Take Pictures. I took so many pictures but tried my best to stay off of social media. I checked instagram about 4 times and that was it because I wanted to live in the moment. I only used my phone for photos and looking up times for events. I also woke up this morning and ordered a post card to be sent to H using Sincerely Ink Cards. A great app and something special for her to get in the mail some time this week. Any tips you'd also like to share?